Why yes, I would! I have sailed on Disney’s Magic, Dream, and most recently on their newest ship, Fantasy. 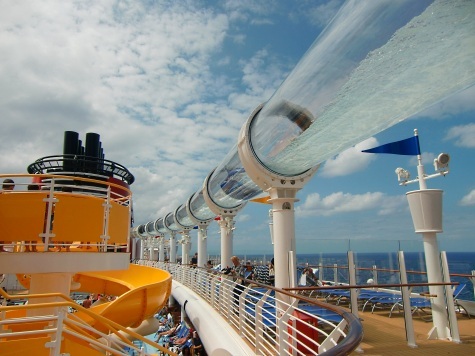 I set sail on Disney’s Fantasy on a 3-night preview cruise for media, travel agents, and their families or friends. Because I didn’t want to spend the money to fly the whole family to Florida, and because my three best friends and my sister were all unable to accompany me for varying reasons, I went solo. Was it lonely? A bit. Was it incredible nonetheless? You bet your mouse ears it was! 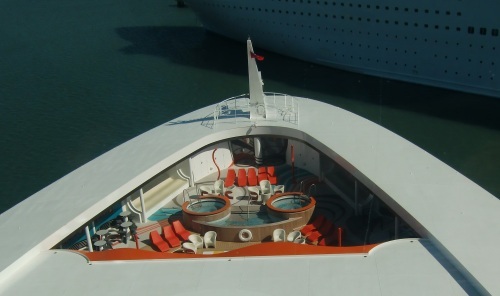 Cruising alone enabled me to really take notice of the fantastical details on this ship without distraction. (Plus, I got to enjoy some Disney Fantasy nightlife with some fellow solo cruisers!) Here are some photos of my discoveries. 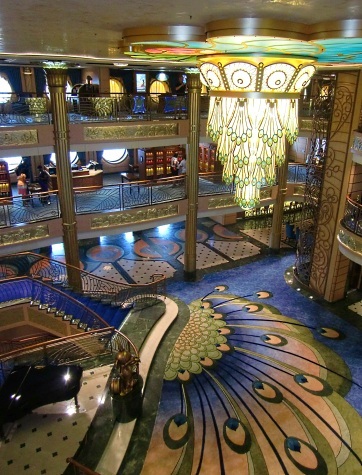 This gorgeous Atrium Lobby with its peacock chandelier and matching carpet is the first thing you see when boarding the ship. The AquaDuck Water Coaster and nearby yellow Mickey’s Pool Slide attract eager sliders all day long. I was surprised to find the unique-to-Fantasy AquaLab empty. I suspect that on full sailings this area near the entry to the AquaDuck will attract more splashers seeking a reprieve from full pools and the Caribbean sun. I caught a glimpse of the totes swanky teen-only Vibe Sundeck from the at-sea spa. No adults are allowed in (besides counselors) because that’d be, like, so uncool. 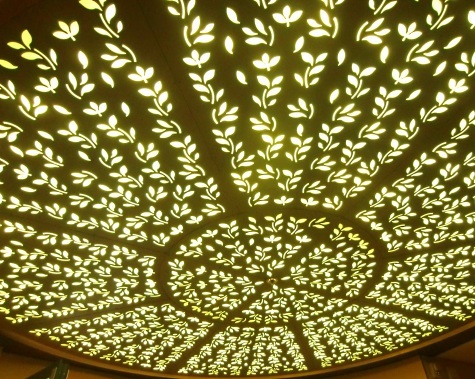 These gorgeous nature-inspired ceiling lights set the tone at Senses Spa & Salon. 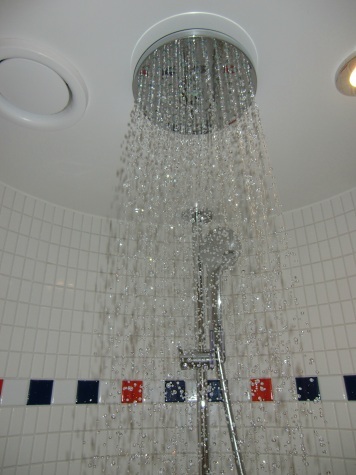 Disney is always working to step it up a notch, like by adding rain shower-heads in stateroom bathrooms (a luxurious cruise ship treat) and unique at-sea circle-shaped bathtubs (perfect for bathing young cruisers). 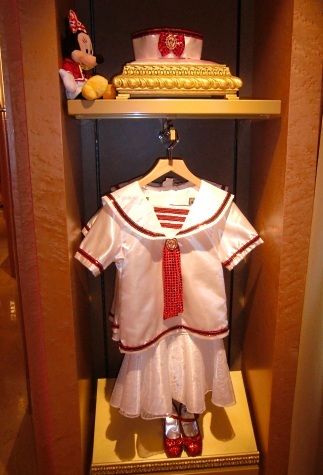 This nautical Minnie Mouse ensemble is just one example of the numerous costumes available as part of princess makeover packages at the Bibbidi Bobbidi Boutique. Boys (and girls) can opt for pirate packages too. There are two adult-only restaurants available on board Fantasy — Palo and Remy. Reservations, fancier garb, a supplemental fee and a big appetite are required. 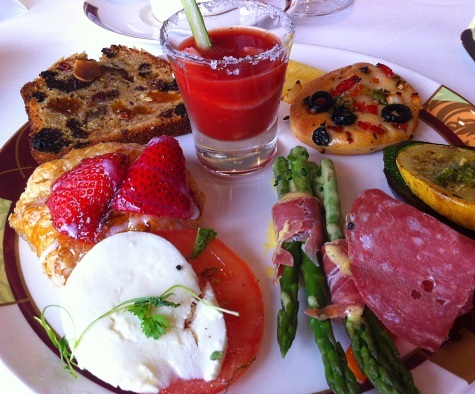 This is just one of three plates of food I savored during brunch at Palo. 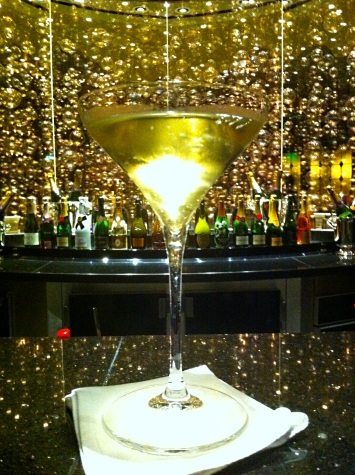 Feel like you are immersed in a bottle of bubbly at the French Ooh La La Champagne Bar. This is just one of several European-themed bars and nightclubs on board. Every drink tastes better with a glowing “ice cube” in it, don’t you think? This photo of me was taken at Currents bar on the 12th deck above the adult-only Quiet Cove Pool. It’s one of my favorite places on the ship. Cheers! Do you have any questions about Disney’s new ship, Fantasy, or about Disney Cruise Line in general? Bring it! Please leave your question or comment and I’ll be happy to respond! 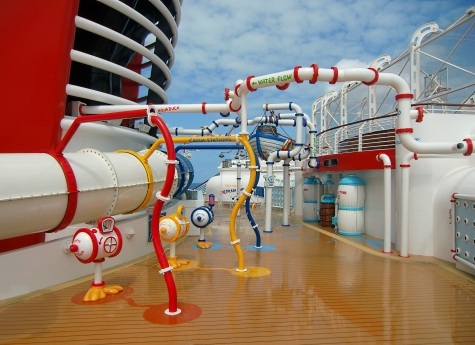 A note from the Travel Mama: Thank you to Disney Cruise Line for inviting me to sail on Fantasy! It looks fabulous! The one time that we cruised Disney was on the Magic when my daughters were 9 and 2.5. Now that I have a teenager, I would love to know what teens think of their private space. Do you know anyone that has cruised the Fantasy or the Dream with a teenager? Lisa – I can’t think of anyone I know personally who cruised Fantasy or Dream with a teenager. You might want to check out the Disney boards at http://www.CruisCritic.com or the Passporter boards – surely there are plenty of peeps who have done this who could let you know what their teens thought. When I did a 10-night Disney Cruise through the Mediterranean in 2007 we met a few families with tweens/teens. Every year these three families pick a different spot and travel together. This was their first cruise and they LOVED it. They said their teens were in heaven. I think teens like it because they have their own space and can meet others of the same age rather than being stuck with boring ol’ mom & dad! Hard to photograph oneself whilst flying down a waterslide! Love the photo of Vibe! SInce I never got to the spa (boo hoo!) I missed that view! I took the photo during the sailing away party, which explains why it was so empty. Looks like sweet place to hang out! 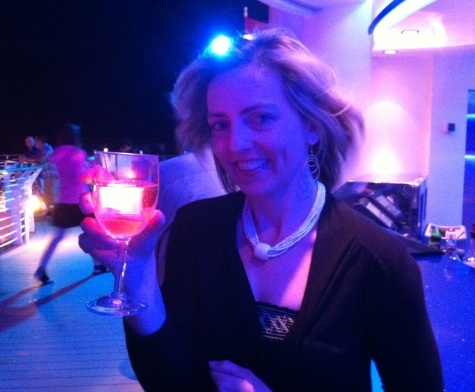 That is a great picture of you looking all relaxed on your cruise! Thanks so much, Jen! And thanks for the tweet! I think I may use this photo as my personal Facebook profile pic. Karen – I tried to convince my extended family to go on a Disney Cruise for our multigenerational family reunion vacation but my brother-in-law was absolutely dead set against cruising (even though he’s never been on a cruise). I do think a Disney Cruise would be INCREDIBLE for a multigen trip, though, because Disney Cruises have so much to offer every single age. If you have people in your party who are intimidated by too much in-your-face Disney, I’d suggest going with one of their older ships, Magic or Wonder, since there is still plenty of Disney for those who want it, but the touches are more subtle for people who don’t like overstimulation and Mickey Mouse galore. Here’s a post singing the praises of Disney cruises for every age that you could share with your family: https://travelmamas.com/disney-cruise-the-ideal-family-vacation/. If you have foodies in your group, you could tempt them with this story: https://travelmamas.com/remy-disney-cruise-line-fantasy-review/ For the teens/tweens in your party: https://travelmamas.com/is-disney-cruise-line-for-teens-and-tweens-too/ And this post outlines the benefits of multigenerational cruising in general: https://travelmamas.com/why-cruising-is-great-for-multigenerational-travel-sanity/. I hope that helps! Bon voyage! Thank you so much! Actually we are foodies and wine-os. I am itching to try this!!!! !